Welcome to our website. We hope you find it informative and easy to navigate. The staff at Pinellas Central Elementary is dedicated to the complete education of each child through a strong emphasis on academic rigor and technology. Our family oriented school offers a variety of activities throughout the year to challenge the students academically and socially in order to promote highest student achievement. Our comprehensive approach to a complete education is by involving the family, the students, staff, and technology to develop children who are lifelong learners. 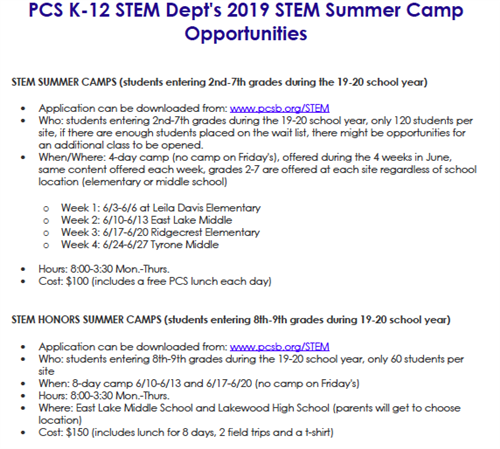 STEM Summer Camp applications are now available. Girls on the Run at Pinellas Central Elementary!!!! Girls on the Run is more than a running club! We inspire girls to be joyful, healthy and confident using fun, experience-based curriculum, which creatively integrates running. Over the course of the program, girls will develop and improve competence, feel confidence in who they are, develop strength of character, respond to others and oneself with care and compassion, create positive connections with peers and adults, and make a meaningful contribution to community and society. The mission of Pinellas Central Elementary school is to create a safe and positive learning environment where all individuals feel valued and challenged to reach their highest potential.